The 18-mile long Petaluma River drains 146 square miles of valley and gentle rolling hills into San Pablo Bay. The river is tidal for 12 miles and bordered by a 5,000 acre salt marsh. 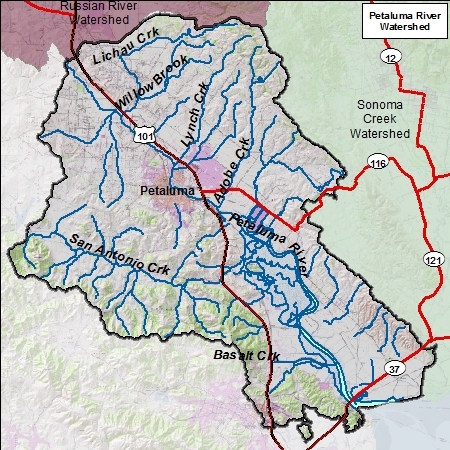 Both Chinook salmon and steelhead trout use the Petaluma River and its tributaries. General Mariano Vallejo built a summer home – Rancho Petaluma Adobe near the tidal marsh in 1836 on his 66,000 acres of land; he lived in the town of Sonoma most of the year. The City of Petaluma began in 1850 and focused on shipping agricultural products to San Francisco and the gold fields via the river and bay. Milled grain, chickens and eggs were early exports. Today sheep, cattle and horse grazing, diaries and vineyards are major agricultural uses in the watershed.